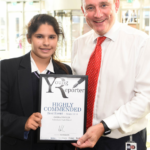 We are delighted that two of our pupils, Zahra and Ellie, were recognised for their journalism skills at the 10 year celebrations for the Young Reporter Scheme 2018 this summer. 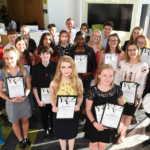 The Award Ceremony was held at the Newsquest offices in Quadrant House where, following the ceremony, a buffet was enjoyed by the winners, their families and representatives from their schools. 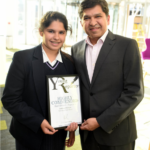 There were thirty-three awards in total, presented to students from Years 10 through to 13 and two students were presented with the Top Reporter Award from each category. We look forward to seeing how our girls continue to develop their skills and hopefully scoop further prizes! 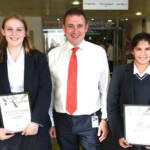 Girls from Sydenham High School compete in the Young Reporter Scheme every year and we’re delighted that two of our students are 2018 winners. We firmly believe that our girls should learn to challenge the world around them and think independently; we recognise the important contribution that the Young Reporter Scheme makes to the development of key life skills. Our year 10 students thoroughly enjoy the experience of competitive writing, with a clear link to the working world.